Amaco’s newest line of glazes will open up new possibilities for your studio! These mid-range/high-fire satin mattes offer eye-popping bright colors coupled with a smooth, satiny surface – making these a great compliment to complex forms, sculptural projects, detailed textures, and more! 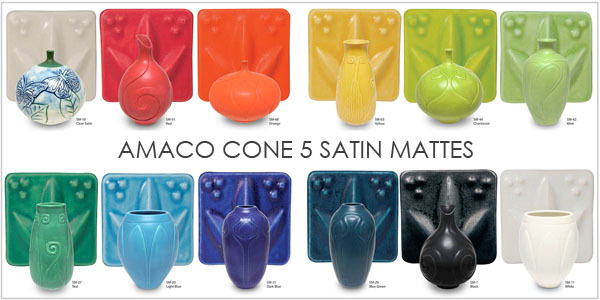 The Cone 5-6 Satin Mattes come in twelve different colors, but their range goes well beyond that. These glazes are fully mixable, so you can create your own unique palette without worrying about how the different glaze chemical will interact! Treat your glaze application like a painting session. Please note that because the orange and red glazes have a different base, they cannot be cross-blended. Use the Clear Satin base to lighten tones. This product has been approved for use by all ages by the Art & Creative Materials Institute.